Unfortunately, the Colony will not be offered in summer 2018. Please check back! The Colony offers writers the space and time to read, write and engage serious writers from around the world. 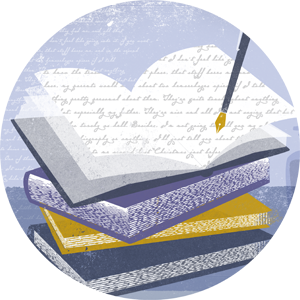 Lead by the distinguished faculty of the University of Kentucky’s Creative Writing Program, the Colony offers workshops in fiction, poetry and nonfiction. The program emphasizes imaginative development and the creative process while providing positive feedback in a non-competitive, constructive environment. By helping students to become more purposeful and aware of their writing strategies, the Colony also prepares participants for the independent and creative thinking necessary for collegiate success. The KYWSC is not like summer school. While a rigorous schedule of workshops and discussion is in place, students have ample time to read, reflect, converse, experiment, and explore. For this reason, colonists must be self-motivated, responsible, and dedicated to honing their craft: learning to observe the familiar in the unfamiliar and the unfamiliar in the familiar; to transform observations into creative works; to collaborate and discuss writing; and to revise and reimagine. Workshop leaders and special guests include publishing current and former faculty from among the University of Kentucky’s Program in Creative Writing and Department of English, such as Frank X Walker, Julia Johnson, Michael Carter, Gurney Norman, Erik Reece, Hannah Pittard, Bobbie Ann Mason, Andrew Ewell, Jeff Clymer, and Manuel Gonzales. Lunch will be provided daily. Dietary restrictions will be accommodated. Please make sure to note these considerations on the registration form. While on campus all events related to the Kentucky Young Writers Summer Colony will take place in The 90, the Fine Arts Library, the Presidents’ Garden and many more. Tuition for the Kentucky Young Writers Summer Colony is $400 per student. A $100 deposit is due at the time of registration. You can also have the option to pay the total tuition in full at the time your register. The registration deadline is June 10th. Apply by March 25th and receive a $50 discount (Early bird registration $350). After June 10th, registrations will be placed on a waitlist and assessed a $25 late fee ($425 total registration). Late registrations will be notified no later than June 17 if they are moved from the waitlist into the program. As previously stated tuition includes lunch daily. It will also include a t-shirt and all coursework materials. Please note, there are no grades or college credit offered through this program. For questions regarding the program, email Program Director Julia Johnson at julia.johnson@uky.edu.